With World Cup in full swing, Brazilian culture has come to the forefront of Toronto's collective attention - though there are more than just sports bars that deserve recognition. We surveyed the city to discover that there's a lot more to Brazilian culture than steakhouses and soccer. The list below culls the best restaurants, cafes, dance venues and festivals to get a real taste of what this Latin American giant has to offer in Toronto. Here is a guide to Brazil in Toronto. Newly opened in Parkdale, this Latin American snack bar leans towards Brazil while nodding to neighbouring countries. Try the burger made of Picanha (a favourite cut of meat) and wash it down with Caipirinha cocktails chilled with coconut water ice cubes. This Corso Italia restaurant is home to authentic Brazilian standards coxinha (chicken rolls), kibe (ground beef rolls) and Frango com queijo e mandioca (cheese covered fried chicken served with fried cassava). This Brazilian snack bar in the Church Wellesley Village is known for its pao de queso - cheese buns made with cassava starch - (50 cents) and frozen acai bowls ($10) topped with granola, guarana syrup and fruits. A taste of Brazil in the heart of Corso Italia does Brazilian staples like feijoada, a baked black bean with smoke meat stew, as well as a fusion of Portuguese and Italian dishes. Try the frango com catupiry, a pizza topped with tomato sauce, chicken, oregano and house-made Brazilian cheese. A stalwart on Dundas West known for strong coffee and a daily roster of Latin comfort foods. This popular Dundas West bakery is a reliable source for specialty coffees, sandwiches, salads and desserts like queijadas (custard tarts) and and bolos de arroz (rice flour cupcakes). Two Toronto rodizios and one in Niagara are a meat lover's paradise where all-you-can-eat barbecue is paraded around the restaurant and carved table-side until you tell the waiters to stop. Another example of an ACYE steakhouse on the Danforth that offers a prix fixe for $40 on weekdays or $50 on weekends. Help yourself to the salad bar or wait as over a dozen cuts of meat are offered to each table. This massive Richmond Hill restaurant does both rodizio and Brazilian brunch. In addition to the meat-heavy menu, try visiting on a Thursday when seafoods are on special too, including grilled swordfish kebab, jumbo prawns, bacon-wrapped scallops and more. On Dundas West, this butcher claims allegiance to Portugal, though Brazilian expats will find imported goods and familiar cuts of meats used in traditional dishes. In Kensington Market, this Latin American butcher is known to carry Brazilian bonbons and serve up comfort foods like feijoada. In Little Portugal this Brazilian bar and grill boasts a lovely back patio furnished with picnic tables. Inside is an ideal spot to watch sports events while snacking on fried cassava or pastel (Brazilian empanadas). Also in Little Portugal, this sports bar where fans of team Brazil congregate. If cheering works up an appetite, try the Brazilian hamburger, fully loaded with strips of bacon, a fried egg, ham, chicken, cheese and all fresh toppings like lettuce, tomato, corn. The dancehall is home to live salsa, jazz, Brazilian, African and world music, though they book everything from classical to punk. Look for their salsa dancing and dinner packages on Friday and Saturday nights. 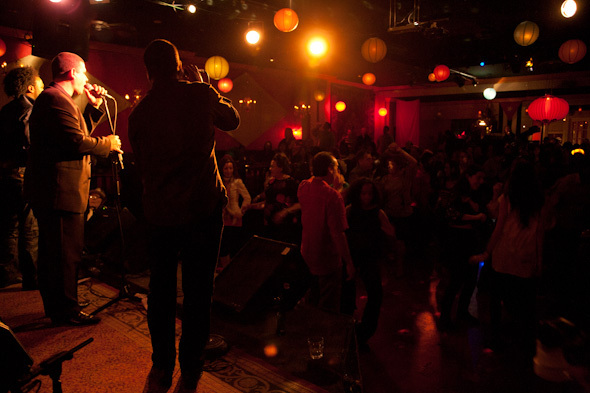 While not specifically Brazilian, the nightclub hidden in the basement of The Mod Club hosts rioplatense nights on Saturday nights, featuring a cross-section of Latin styles including cumbia, cuarteto, salsa, merengue and bachata. 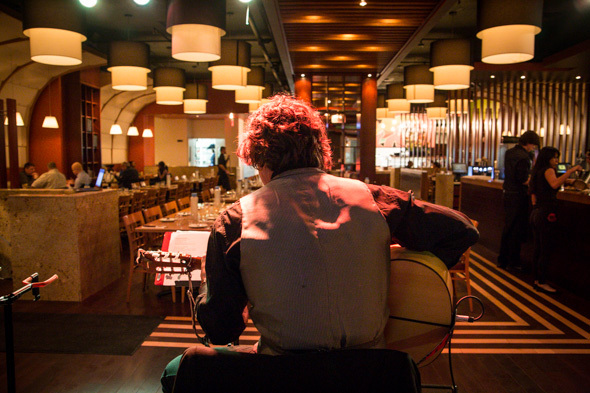 The restaurant and martini bar hosts Banda ZĂŠ Fua, Brazilian folk dance music on Thursday nights and Brazilian samba jazz on Fridays. A hub for Brazilian culture, this studio lists Brazilian drumming, African drumming, Samba bateria drumming, Afro-Brazilian dance, and capoeira on its programming and classes schedules. Founded in 2003, The Toronto International BrazilFest (BrazilFest) attracts over 30,000 people to its annual summer showcase of Brazilian culture, featuring the best food, arts and entertainment from the Brazilian community. The Brazilian film and television festival takes place annually in the fall. The display of Brazilian culture in film screenings encompasses a curated showcase of films both submitted for competition and invited as well as Bra-zoo-kah (films by Brazilians living abroad), and Brazil Through Foreign Eyes (films by non-Brazilian filmmakers about Brazil). showcase a selection from the new wave of Brazilian filmmaking, including fiction features and documentaries. What did I miss? Bolster this guide to Brazil in Toronto in the comments. Top photo by Black Tux in the blogTO Flickr pool. Additional photos by Jesse Milns and Irina No.